Fun and fruity! 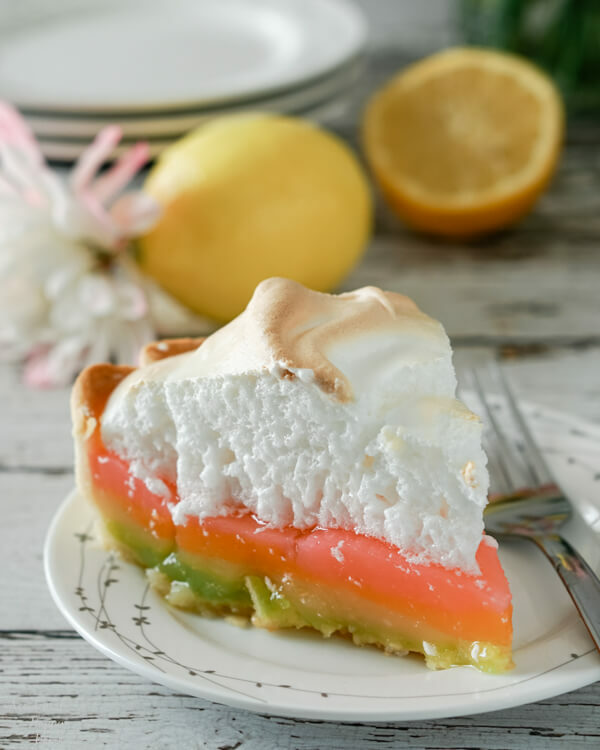 Rainbow Lemon Meringue pie has the fresh sweet citrus flavor of classic lemon meringue with a colorful rainbow surprise hiding inside. I don’t know why, but for years now I have made a rainbow dessert around Easter time. Usually I make rainbow jello, but I haven’t been making that as much since I accidentally caused a steam explosion in my microwave boiling water. Yes, that’s a true story. Once I blew up my microwave by way of steam explosion while making jello. I put the accidental in accidental happy baker. I screw up and then I laugh about it. It’s just how I am. 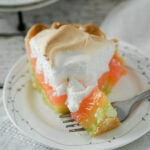 I love this rainbow lemon meringue pie because it’s easy to make. 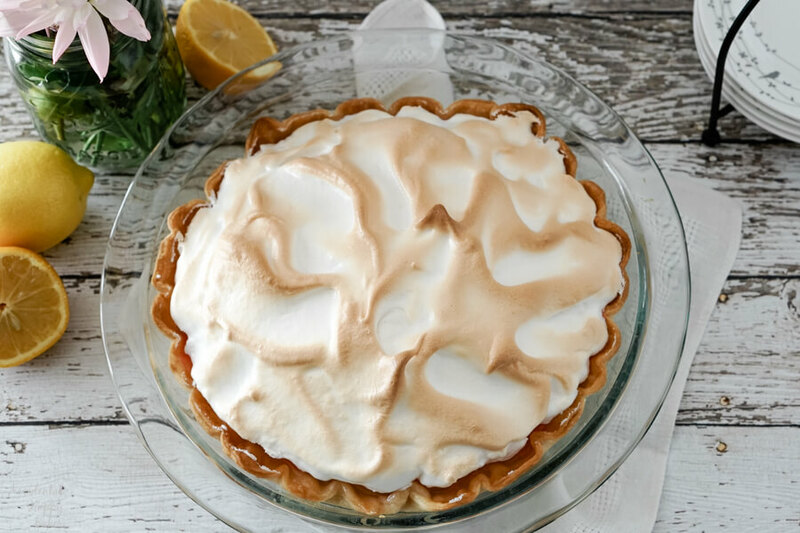 Lemon meringue pies are one of those things that look deceptively hard and time consuming, but are actually one of the quickest and easiest pies to make. Bonus: Baking with lemons makes your kitchen smell amazing! 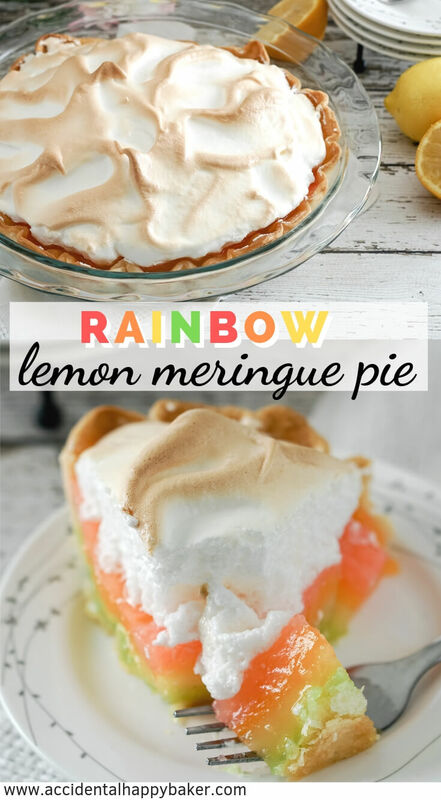 What do I need to make rainbow lemon meringue pie? You might be wondering what the difference is between a rainbow lemon meringue pie and a regular lemon meringue pie? Literally nothing is different except the color. I just love rainbows and thought this would make a fun pie! If you’re not down with food coloring, feel free to simply omit for a wonderful classic lemon meringue pie. 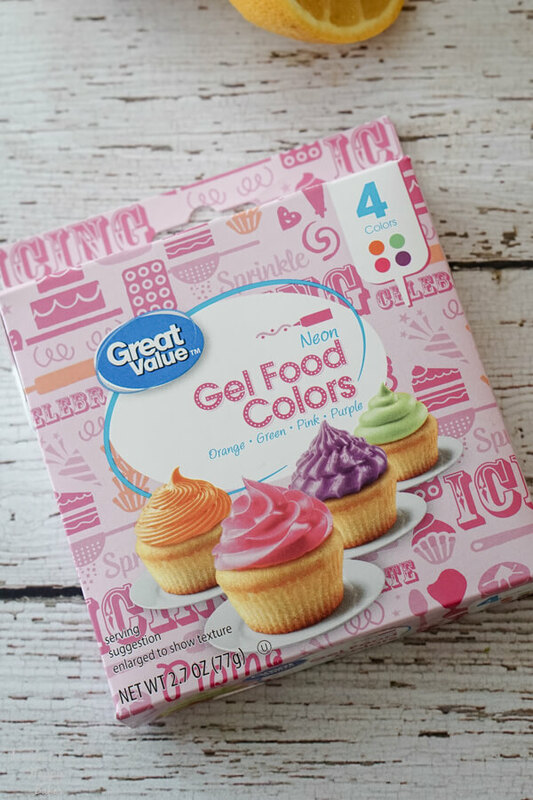 What food coloring to use? I use this food coloring from Walmart because I live in the boonies where there aren’t a lot of shopping options. You can use any brand, but I suggest using these colors; pink, orange, and green. Remember blue or purple mixed with the yellow lemon filling will make a gross greenish color and should be avoided. This recipe was inspired by this post by mother and daughter food blogger team, Pat and Dahn, at Savor The Best. It was originally posted on AHB in April of 2015, but has been updated with new photos and recommendations. 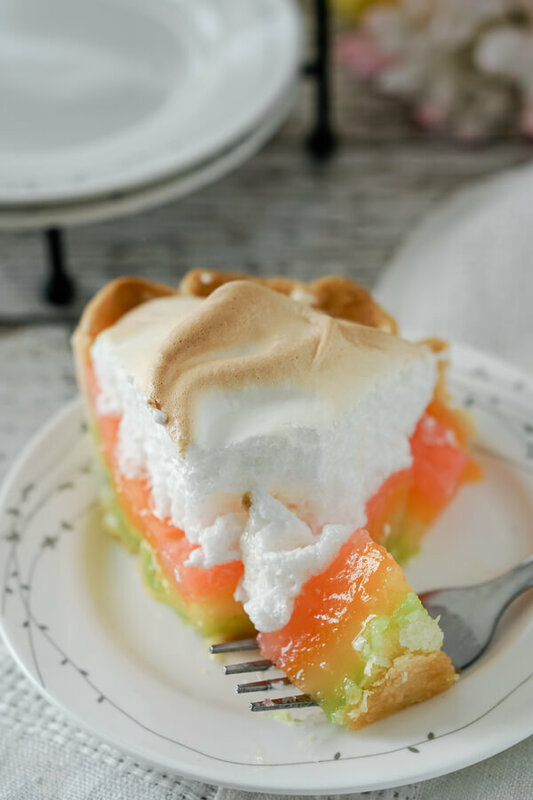 Lovely layers of rainbow color match the bright flavor of a classic lemon meringue pie for a fun and festive springtime twist. Separate the eggs, placing the whites into a medium sized mixing bowl, and the yolks aside to be used later. Using an electric mixer, beat together the egg whites and cream of tartar until the egg whites start to become foamy. Start to add in the sugar, adding only one tablespoon at a time and beat until the mixture becomes thick, white, and glossy. Add in the vanilla and beat until stiff peaks form when you pull out the beater. Set this aside while you make the filling. In a medium sized sauce pan, combine the sugar, cornstarch, and pinch of salt. Add the lemon zest, lemon juice, cold water and egg yolks and whisk thoroughly. Slowly pour in the boiling water and butter. Stirring constantly, cook over medium-high heat until the mixture comes to a boil. Let boil one minute. Divide the filling equally into 4 bowls. Each part will be about 3/4 cups. Add one to two drops of food coloring to 3 of the bowls, stirring well to disperse the color. Leave the 4th bowl as it is. Layer the colored lemon filling in the prepared pie crust. Spread the meringue over the hot filling, taking care to spread the meringue completely to the edges of the pie. Place the pie in the oven and bake at 375 degrees for 10-12 minutes or until the meringue is set and the tops of the peaks are lightly browned. Cool completely on a wire rack and serve. This recipe was inspired by this post by mother and daughter food blogger team, Pat and Dahn, at Savor The Best. Please leave a comment or review below! I’d also love to see what you’ve been making on Instagram or Facebook. I love Lemon Meringue Pie. I never really thought about making it colorful! Thanks for sharing. My mom is the pie baker in our family. I don’t have the talent for it. I hear ya. There are some things that mom’s just do best period. There are certain things I won’t even attempt because I know that mine will never turn out like my momma’s. How cute!!!! I’ll pin it just in time for Easter. Thanks Jennie! What do your Easter celebrations include in France? Oh, Amy….that looks beautiful! Perfect for Easter with all the Easter-egg colors. 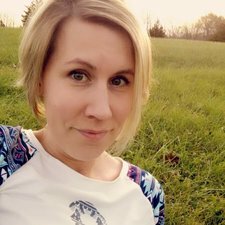 I love your post and your story. Thanks so much Pat! I loved your stories too. I love this! 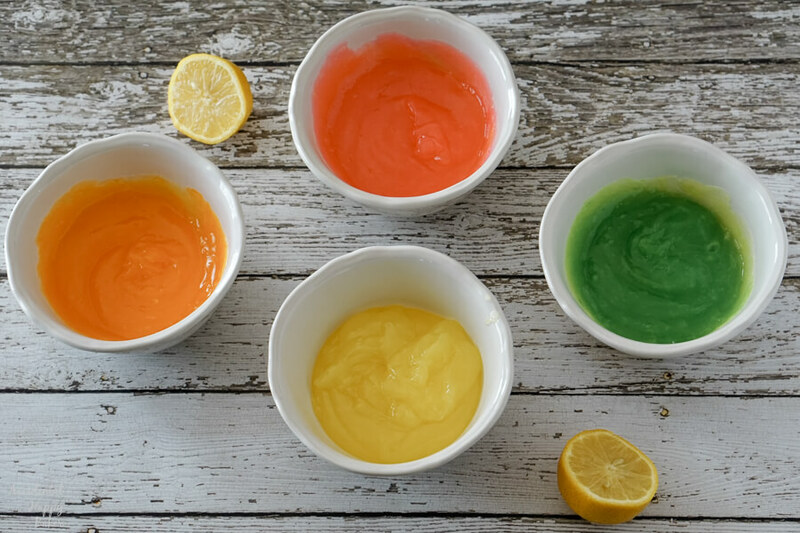 I never would have thought of making my lemon pie rainbow — what a great springy touch! You are right on the money regarding the work and kids LOL. When my older girls were little I made matching outfits for all the holdiays. There is one Christmas picture missing a child because she refused to have her picture taken. Kathie, my kids beg for me to make rainbow jello at springtime, which takes all day to do. I was hoping that I could get by with rainbow lemon meringue pie, which takes less than a half an hour. They liked it, but told me that it will never replace rainbow jello and they still expect to have some this week. Haha. I hate it that that happens for family pictures, but it just does. 🙁 I didn’t get any mother’s day pics with my kids last year because one of the kids decided that they were going to pick a fight with their brother and so two of them were crying. I said forget it. Amy this turned out great, I love it! You are so on spot about the work and emotions that go into Easter preparations but I agree that it is all worth it. Good memories!! Thank you, Dahn! I had hoped it would be a little more pastel but I still think it turned out pretty. I’m crossing my fingers that perhaps this year we can actually get a good family picture without anyone pouting! A mom can dream.